"Bruce's pictures have this other sense," explains his older brother Larry, a gifted landscape painter who has been Bruce's best critic since they decided at the same moment to become painters. "They are a little bit strange." Bruce Cohen: photo by Gene Fama A consistent painter who has been working with the imagery of still lives in interior settings for over 30 years -- "It's not like he ever took two years off and did portraits," notes his brother -- Bruce Cohen has a probing, restless mind and an attraction to the metaphysical. Although his paintings have the burnished clarity of Old Master paintings, they aren't about observation: they are put together, not observed. Cohen's fluent hybrid style, with its rich narrative suggestions, is the product of a lifetime of study, absorption and practice. At age 15 Cohen received a summer scholarship to study life drawing at the Otis Art Institute. Later, at the College of Creative Studies of UC Santa Barbara, his brother Larry introduced him to Paul Wonner, who became a mentor to both young men. "Wonner was somewhat against the grain; a representational painter." Larry recalls. "For 35 or more years he helped us out, and that had a huge effect." Bruce agrees, adding that he found in Wonner's work sense of "poetic magic that can really move you." After studying at UC Berkeley Cohen settled in Los Angeles. 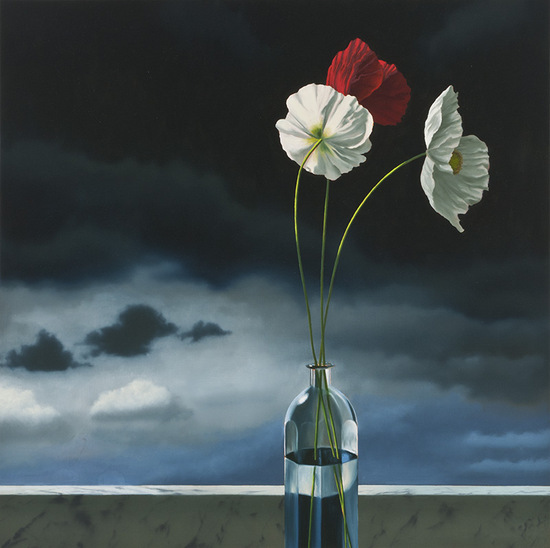 He earned extra cash painting houses, and also began to exhibit successfully; he had one man shows at Asher/Faure Gallery in Los Angeles in 1981 and 1983, then a 1985 Bay Area debut at San Francisco's prestigious John Berggruen Gallery. Now 58, he has gone through a long evolution, but not, according to the artist, a conscious one. Cohen first absorbed the influence of Renaissance and Surrealist paintings as a young man, then studied 17th century Dutch interiors and domestic scenes. Bay Area Figurative paintings -- in particular the works of Wonner and Diebenkorn -- made their impression next. Nabi Bonnard and Vuillard are there in Cohen's mature work, and so is an affection for Indian miniatures, which have provided ideas about how observed nature can be manipulated. The still life paintings of Giorgio Morandi, rich in poesia, have also had their effect. 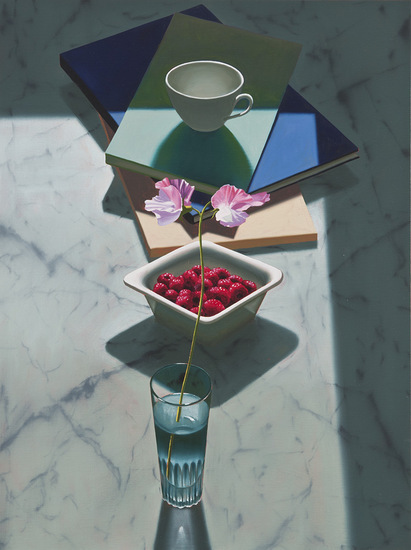 Untitled (Still Life with Raspberries), 2010 oil on canvas 28 x 21 inches © Bruce Cohen, Courtesy of Louis Stern Fine Arts When asked how he starts a painting, Cohen responded that he often begins with light; "It gives me an initial motivation, and then other things start to develop." 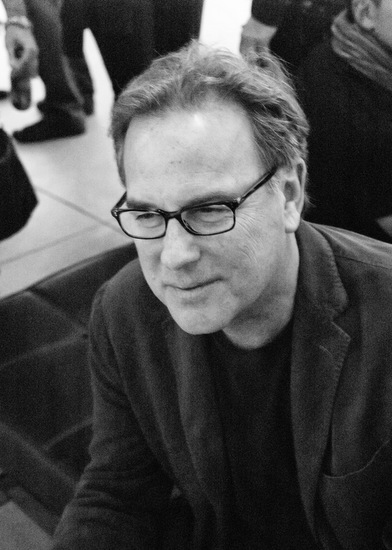 Cohen's subject matter evolves over time in what he calls an "observation collage process." Although Cohen certainly looks at the things he intends to paint, he prefers to "ultimately not be confronted with those things." As a result, his images come from drawings, from photos, and from the imagination. His colors tend to be invented; "...they are not plein air," Cohen notes. The results are somewhat surreal and mesmerizingly theatrical. Cohen struggles quite a bit as his paintings coalesce, and wipes out quite a bit along the way. Still, he wants the finished result to be opaque, and carefully edits any hints of process that may remain. Cohen's paintings don't literally include the human figure, but their presence is somehow implied. "I feel sometimes that I am looking at a place where some tremendous, mystical event has just taken place," wrote Paul Wonner. "The people concerned have just moved on out of sight, but there remains on the scene the residue of a magic moment." 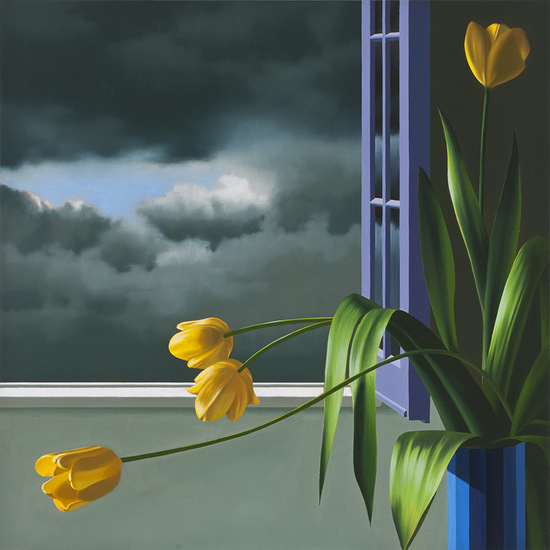 Untitled (Yellow Tulips, Departing Storm), 2011 oil on canvas 32 x 32inches © Bruce Cohen, Courtesy of Louis Stern Fine Arts In "Untitled (Yellow Tulips, Departing Storm," waxy tulips hang heavily against a bank of clouds that has just began clearing after a storm. They are tired, but still beautiful, reacting to forces that are both present and implied. How long has the window been opened, you have to wonder? What just happened? The image is crystal clear, but the events surrounding it are not. "There is a hint of something else," says Larry Cohen of his brother's pictures. He has been watching Bruce's art develop for 40 years, and even he can't say exactly what that something is. Those are some really tantalizing images, and his lighting is staggering. Thanks for sharing this.